Fraser Island is a popular destination, being the world’s largest sand island and completely surrounded by magical rainforests as old as time. As a World Heritage listed site, Fraser Island offers spectacular nature-based activities that are just as relaxing as they are adventurous. From Lake McKenzie and Lake Wabby that offer freshwater swimming, to climbing enormous sand monuments, or relaxing on the mesmerising beaches, let Fraser Island cast its magic over you. Keen anglers will find themselves in a fishing heaven, with Hervey Bay and the Great Sandy Strait providing hours of entertainment. 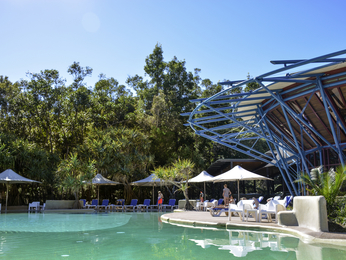 Feel welcome at one of the hotels offered by AccorHotels and our partners at Fraser Island. Discover our selection of luxury to budget hotels at Fraser Island for your next business trip, family holiday or weekend break.